A genius bartender known as Ryuu Sasakura helps customers by mixing the perfect cocktail for them. My first review will be about Bartender. By the score already you must know my stance on this manga. It is a gem that I found. A truly spectacular reading. But I guess it is also the kind that will appeal to a certain audience. As such I will try to explain as well as I can why you should give it a try or let it sleep. 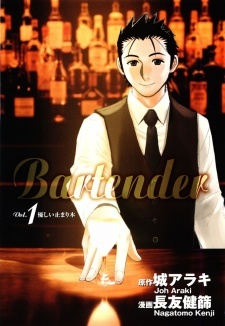 This manga is about Ryuu Sasakura, a young bartender who comes back to Japan after having going around the world for a bit. His philosophy is quite simple yet very interesting. As he says himself, there are two jobs in the world where you cannot lie to your customer. One is a doctor. The other is a bartender. A doctor will do his best to heal his customer's body, and a bartender will do his best to heal his customer's soul. Ryuu Sasakura shows incredible skills at figuring people out and what is going in their head, as he then manage to heal their worries or troubles with a drink and a lesson hidden within his very cocktails. Not only that but I also guarantee you that you'll learn a lot about alcohols too. The art is just incredible. Not only is it well drawn, but it is drawn in a way that puts the right ambiance at the right moment increasing the strength of the emotions the characters are trying to make us, reader, feel about their situation. It is rather soothing and refreshing with a great attention to details too. Probably, no, most likely Bartender's strongest point. The main characters are very well written and easy to like. But it also has a strong cast of other characters in each chapter, some of them who return later and some of them who we will see only once. But it doesn't stop them from being just as well made as the main characters. Each of them has a past, a personality that was worked on. They just don't get more character development but at the very least you'll remember them for who they were and they leave an impression. And it doesn't stop there. The way they interact with each other, especially with Ryuu Sasakura, the main character, leads to multiple interesting situations. It is a shame, truly, that it is hard for me to make justice to the way characters interact with each other, I just hope I could explain it better but it has to be read. I knew a little bit about alcohols, just a bit and I wasn't particularly interested in that but I liked the things I learned, it was rather entertaining on its own, but the manga as a whole with the characters, the story and all, truly a masterpiece. Those who only like action based manga will probably fall asleep on it, but for those who prefer a more soothing and calm manga where words count more than how many sword hits one can do in a second, I highly suggest this manga. It has its share of funny moments too, don't forget about it, but really, the thing that I liked the more about it is just how easy I could go and read it without stopping or being able to notice the time pass. Give it a try, trust me, you will not regret it. Im a big fan of slice of life mangas. As well as a big fan of different styles of alcoholic beverages. And this manga seemed to appeal to me when I first read the description of the story. I found it a breath of fresh air when it comes to realistic manga. No love story of forbidden love, no sudden magic powers, no major plot twists. Just a good old story of a bartender, the life he leads, the customers he serves, and the advice he gives to the problems that they bring to his bar. A lot of the drinks that are mentioned in this manga have inspired me to download a cocktail cookbook onto my tablet and go through it and I may also be trying out in future. Overall I would give this a 9 out of ten. The point being lost as to me sometimes the edges round some of the things in the manga itself drawing wise seemed a little to sharp but thankfully didn't seem to take away the enjoyment of this manga. Repeat this for 160 chapters. The art is amazing, the pages and panels are clean and easy to read, the information about the liquors are rich. However there's no progression, no development and barely a story. If this manga had around 20 chapters it would be great, but unfortunatelly it's not the case. If you enjoy this ultra slow pace, give it a try, else skip it to another manga. By far one of the best stories, that has really drawn me. The story is also by far one the most different ones, even if all we see is customers having drinks at the bar, and Ryuu Sasakura is the one that serves them. But each inidivudal character, that finds themselves wondering into the bar, have such varied stories, which really makes you want to read on. Also, I find it quite interesting that some of the chapters, even include the recipes for the drinks, which is something that is rarely found in any manga. This makes it set apart from other mangas, with it’s varied content as well as characters that are unique, in their own way. The only pointer I have, is that the art of the manga could have been a bit more clearer at some points. Other than that, if you want a different story line, with a great leading character, and with each chapter introducing you to new stories, then you need to have a read of Bartender. There’s just something about anime food that makes us drool with desire, and food has been the main theme of various anime series. If you’re looking to satisfy your food and anime cravings all in one go, get a taste of these fun and interesting cooking anime series.